Anatsuiso (穴通磯) is the rock gates located in Ofunato, Iwate Prefecture. 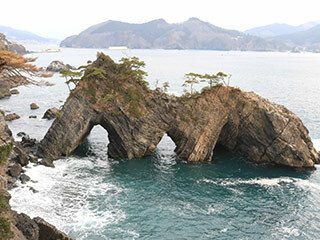 There are three gates in the huge rock that is located in Goishi Beach. It is one of the popular scenery of Ofunato. There is a boat service to go into those tunnels.